With the intention of showcasing their latest manufacturing technology, one of the development partners of Cincinnati Incorporated (CI), Oak Ridge National Laboratory (ORNL) decided to participate in the North American International Auto Show in Detroit. With the intention of showcasing their latest manufacturing technology, one of the development partners of Cincinnati Incorporated (CI), Oak Ridge National Laboratory (ORNL) decided to participate in the North American International Auto Show in Detroit. Their project had an overwhelming set of displays for a variety of technologies, including metal 3D printing, remote wireless charging of a car, 3D printed crash-absorbing structures and large-scale BAAM (Big Area Additive Manufacturing) printed tools. 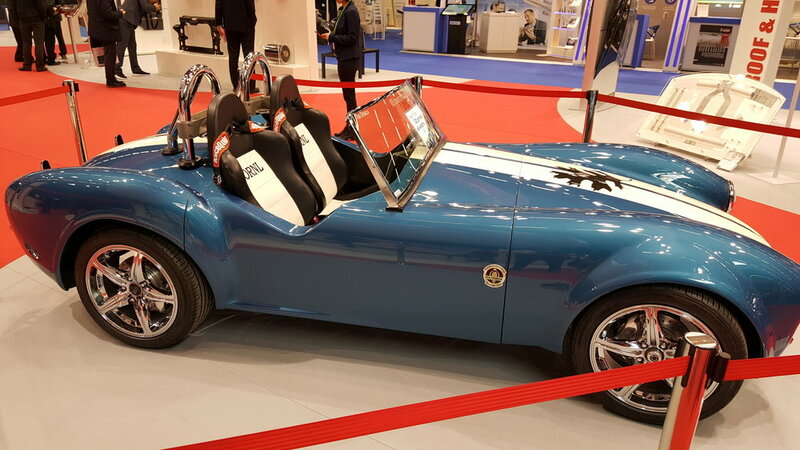 60 days before the show, the development partner decided to scrap the original display plans and build one technology demonstrator based on a full-scale Shelby Cobra. With the assistance of CI, the partner was able to create a suitable 'show car' demonstration in eight weeks. "The project was such a hit that the prototype has been on a world tour, making stops at exhibits like the International Manufacturing Technology Show held in Chicago and COP21, the International Climate Talks in Paris, the White House, and shows on The Discovery Channel," says Carey Chen, the president, CEO, and Chairman of the Board at CI. Over the years, CI has assisted many organizations through its innovative initiatives to reinvigorate a leadership position for itself in technology, quality, and service to its customers. Having established a rich heritage of making some of the world's most robust metal fabricating machinery including press brakes, shears, and lasers, the firm has expanded its operations into additive manufacturing landscape. "Traditionally, 3D printers were making small fragile parts for visualization of product prototypes which was expensive and slow. Further, the additive industry continues to make parts with smaller layers for better resolutions and surface conditions which inherently take a long time to operationalize," says Chen. By leveraging the principle and thought - complexity is not necessarily free - CI creates larger layers that can be finished to meet accuracy or visual requirements post-processing. This enables clients to print items at full scale, instead of printing small trinkets which decreases time and increases productivity. In comparison to a typical 3D printer that can produce a one pound part in about a day, the CI BAAM can create a 50 to 80 pound part in about an hour. "BAAM has been built to run around the clock. It is rugged enough to be used in a manufacturing environment and does not need to be in an office space or clean room," adds Chen. Being a 119-year-old machine tool company, CI's partnership with ORNL has been instrumental to its continuous improvement journey. Through its collaboration with ORNL, CI has been able to accelerate its product development cycle timeline to six months. "We signed a Cooperative Research and Development Agreement (CRADA) with ORNL in February 2014 and had our first order for a machine in July," mentions Chen. Since then, CI has partnered with numerous companies in the development of BAAM to satisfy new applications by building new materials for 3D printing. In their quest to innovate and develop continuously, CI is expanding its market into smaller additive manufacturing machinery. In November 2017, the firm recently acquired a company based in Boston - New Valence Robotics (NVBOTS) - to make a smaller printer called SAAM (Small Area Additive Manufacturing). The printer has been programmed on the cloud that allows it to be shared with a large number of engineers seamlessly. Chen adds, "SAAM is completely automated, which enables it to produce part after part without needing constant attention from a team of administrators." as compared to the conventional techniques. its application standards by manifolds.